This mass death of harmful organisms is called ' die off '. This mass die off of pathogenic organisms can create many different unexplained symptoms. Die off is also known as Jarisch Herxheimer Reaction or Herx Reaction. When people and animals are sick and balance within the intestinal environment has been disrupted, this sets the stage for three things to happen. These toxic wastes are known as Endotoxins. An endotoxin is a toxic substance bound to the inside of the hard bacterial cell wall of an organism, and released when the organism bursts or ruptures. All this toxic waste must be processed through the liver, filtered by the kidneys, carried by the lymphatic system through the blood stream, and sent out of the body through the colon. If this huge toxic load is released too quickly, or is too much to be eliminated through the colon in the form of feces, the body will look for another way to get rid of it. This micro organism overgrowth and resulting toxic waste products are very acid, and so commonly irritate and burn the areas of the body that are attempting to ' get it out '! Here are some of the symptoms you might notice. 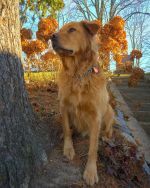 Healing crisis symptoms can even occur when your dog starts on a better nutritional program that includes a higher quality healthier natural dog food. The introduction of higher quality foods, in place of the lower quality food being used previously, can prompt natural cleansing, and sometimes a slight healing crisis too. Has your dog ever experienced diarrhea after switching dog food? The closer food is to it's natural raw state, the higher the quality and nutritional value. In this natural state, the enzymes are still intact, and have not been destroyed by heat and processing. Amino acids, vitamins and minerals and trace elements, are all intact. There is a very strong connection between the length of time your dog has been sick, the quality of food eaten, and the amount of time it will take to recover. Here's what Stanley S. Brass, N.D has to say about higher quality food.
" When the quality of food coming into the body, is of a higher quality than the tissue which the body is made of, the body begins to discard the lower grade materials, for the superior materials, which it uses to make new and healthier tissue." Read that statement again carefully. This is important holistic healing information. It is critical to know what, why and when a healing crisis happens. But it's also important to understand how to get through it, if it occurs. This is all quite fascinating! Your dog's body is very wise. It will always aim for improvement and better health on it's own naturally. Your dog's body will never stop trying to heal itself. This is the way of Mother Nature. She will always strive for homeostasis. The body will always strive for a state of balance. As the body removes and discards toxins from the tissues, they are transported through the bloodstream to the liver and kidneys for cleansing, filtering and elimination. The liver and kidneys are your dog's main detoxifying organs. It is your job at this time, to be able to a understand and interpret the natural changes and symptoms that might occur. Watch for clues that cleansing is happening too quickly. An odd phenomenon of a healing crisis, and a clue that cleansing is happening too quickly, is that your dog appears to get sick again. So don't be surprised if your dog gets worse before he gets better! However, your dog is not really sick again. This healing crisis will occur only when your dog is strong enough to handle it. It will never happen when your dog is too weak. This initial stage of a healing crisis can last anywhere from a couple of days to several weeks. Your dog will conserve and internalize his energy. Repair and reconstruction of his internal organs and all body cells has begun. He may appear tired and unwell. He is! Give him a break!
" Oh my Gosh, he's sick again, I thought he was getting better. I can't stand to see him sick again." So, they quit. This causes the dog to fail in his attempt to heal himself and recover. He wasn't given enough time to completely get through this healing crisis. If they had only waited a little longer, their dog would have passed this critical time and he would have begun to feel better. It is important to know that a Herxheimer reaction can happen more than once. It can happen several times or more. It will happen in cycles as many ties as it needs to happen. There is no way to control this. With each healing crisis a new level of better health is achieved, until finally all toxins are shed and vibrant good health is attained. This repeated process of cleansing and healing is called retracing. Retracing is the process of bringing your dog's body back to the state of health known as homeostasis, balance, in other words. Please allow your dog to work through this retracing process. It may happen several times. The rewards are worth it. If you allow your dog's body to discard these accumulated toxins gradually, in stages, now, you will save him from more serious disease later in life. Helping your dog through a healing crisis is a fascinating, difficult and emotionally draining process. Dog owners find it very hard. A healing crisis can be your dog's friend if you go slowly and methodically and calmly, through the process. It can be a foe if done too quickly or if left uncompleted. If you don't finish the process you will leave your dog with a body full of toxic waste and uncomfortable symptoms which can then lead to other life threatening dis-eases such as cancer. Cancer is the ultimate imbalance! Cancer is now the #1 killer of dogs. That's a shame, and totally inexcusable. You can save your dog from this untimely demise. We live in a ' quick fix ' culture. 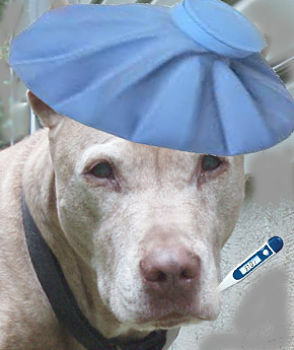 I sincerely hope that you will give your dog enough time to heal. The rewards are worth it. You will have your naturally healthy dog back again.